(Nanowerk News) Water pours into a cup at about the same rate regardless of whether the water bottle is made of glass or plastic. Research into the properties of liquids confined by different materials was sponsored by the Department of Energy's Office of Basic Sciences and the National Science Foundation. 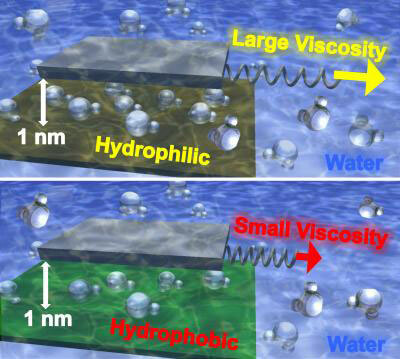 The results were scheduled to be reported September 19 in the journal Nature Communications ("The interplay between apparent viscosity and wettability in nanoconfined water"). The viscosity differences created by container materials are directly affected by the degree to which the materials are either hydrophilic -- which means they attract water -- or hydrophobic -- which means they repel it. The researchers believe that in hydrophilic materials, the attraction for water -- a property known as "wettability" -- makes water molecules more difficult to move, contributing to an increase in the fluid's effective viscosity. On the other hand, water isn't as attracted to hydrophobic materials, making the molecules easier to move and producing lower viscosity. In research reported in the journal, this water behavior appeared only when water was confined to spaces of a few nanometers or less -- the equivalent of just a few layers of water molecules. The viscosity continued to increase as the surfaces were moved closer together. Experimentally, the researchers began by preparing atomically-smooth surfaces of the materials, then placing highly-purified water onto them. Next, an AFM tip made of silicon was moved across the surfaces at varying heights until it made contact. The tip -- about 40 nanometers in diameter -- was then lifted up and the measurements continued. As the viscosity of the water increased, the force needed to move the AFM tip also increased, causing it to twist slightly on the cantilever beam used to raise and lower the tip. Changes in this torsion angle were measured by a laser bounced off the reflective cantilever, providing an indication of changes in the force exerted on the tip, the viscous resistance exerted -- and therefore the water's effective viscosity.